DC is about to assemble the top and is stumped on what color and width to do the sashing. We tried Natural-muslin type color and a darker tealish-blue but not right. Anybody have a good idea for us? Last edited by Kitsie; 07-07-2013 at 09:37 AM. Reason: forgot picture! I think I would try various shades of browns to see which would tie it all together. There seems to be some in most of the squares. Then maybe go with a blue for cornerstones. I would do a triple sashing with 9 patch cornerstones. I'd use one of the background fabrics and one of the framing fabrics in the blocks. 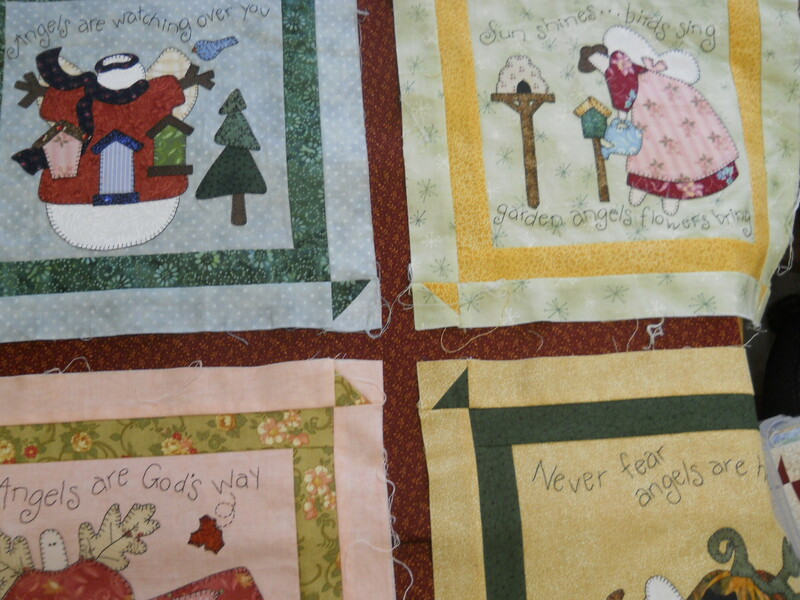 We thought of that, too, but thought it would detract from the appliqued angels. But thanks! How about arranging the blocks so there is color contrast? The block design seems to give the illusion of a frame. If you need it bigger, add more borders. The blocks are all soft so I would add a pop of color. I do like ScissorQueen's idea of 9-patch cornerstones. Since the blocks are all angels, how about a blue/white cloud fabric? Thanks, Sharon, It is a calendar quilt so the blocks are "pre-arranged". We could try the 9-patch style with softer colors. If you use soft colors and make it so the colors on the 9 patches are opposite of the sashing, it looks like they're woven together. I thought a nice pale gingham in maybe green with a pale teeny floral might look good without overpowering the angels. i would try a two-color sashing between each block. for instance Jan/Feb... maroon on the left and green on the right. feb/march... maroon on the left, light green on the right, etc. perhaps a sq in a sq for the cornerstones. What about a soft gray? It looks like it would go with many of the blocks. Let us know what you decide! Thanks to all you helpers! After trying a few fabrics we decided to use a single fabric, browny/rust and no corner stones - at least not in the plans for today! Still a lot more applique to do, but my DC is happy with the sashing fabric! Last edited by Kitsie; 07-07-2013 at 04:55 PM. That is lovely. What is the pattern??? Great idea with the rust/brown. Makes all blocks pop!! !Of course show us the finished quilt!! !